This palm looks wonderful...am very happy with the quality of the product. Enhance the look of your space without the hassle of caring for alive plant with this silk plant. 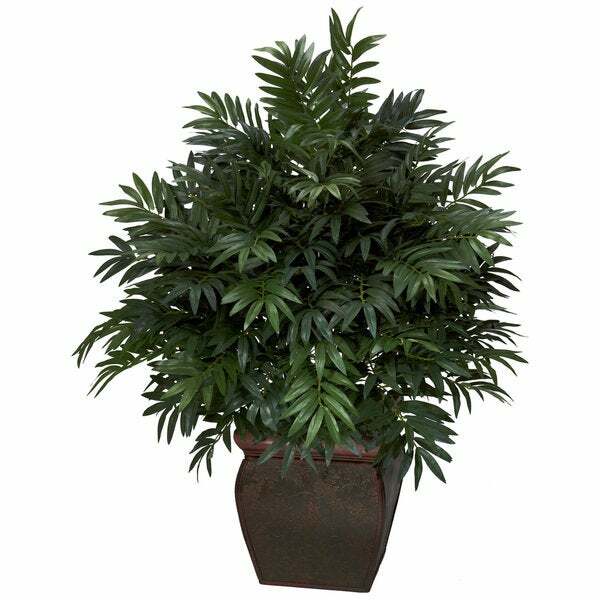 This triple bamboo palm silk plantoffers lush greenery that wipes clean when needed, and the elegantdecorative planter melds well with both traditional and moderndecor. Place the piece on a table as a centerpiece or use it as anaccent piece in your home or office. Since no maintenance isrequired, you can enjoy this silk plant year-round. This plant and planter are basically identical to the picture so if you like the fullness be sure to the this "triple" version, not just the double. It is very realistic and the planter does not look cheap. I am very very pleased with this! This silk plant is very full, but not very life-like. It serves the purpose to add greenery to a dark area. I love this plant. It's very full and has pretty palm leaves. It comes in a nice planter that is a rich brown color. It looks just as pictured, and even though it's a fake plant, it looks very realistic. This plant is so beautiful and looks real. There are lots of leaves and it is really full. The decorative planter looks classy and really looks nice in my dining room. Very nice, life like without the worry. Bought it 2 years ago. Still looks good. Great value for the price. Would recommend to anyone wanting a splash of color. Looks very fabulous for an artificial plant....great accent planter for any room!!! I purchased this plant for my entrance and it looks great. It is nice and full and looks like the picture. It is a great accent piece to my family room. The plant is full and very realistic. The container fits with my decor. Good value. Very full and lush plant. Planter a little old world in look, not to my taste, so replaced vessel, but overall nice plant. Disappointing. Didn't look real. Top heavy. Simply beautiful and looks real without all of the maintenance. Purchased two of them and love them. Great for a corner that doesn't require height. Up close, the plant is obviously a fake, but the effect in a room is mostly natural and a "realistic fake." I'm happy with my purchase. The planter is very nice. "how high is this plant?" it filled the space I needed it to very nicely. "can this plant be used outdoors under cover?" Thank you hcabano for your interest in the Triple Bamboo Palm w/ Decorative Planter Silk Plant. We would not recommend putting this silk plant outside. Thank you for shopping with us! I expect this could be used in a covered lanai, but not outdoors where rain could eventually cause deterioration. The planter is lovely. "What is the size of this plant?" Plant holder: 11.5 inches wide x 13 inches high. Dimensions: 43 inches high x 33 inches wide x 30 inches deep.